The temptation to rip into someone when he or she speaks foolishly at our expense isn’t a stretch for most of us. We get angry at the person who unfairly blames us in a department-wide email. Or we feel ashamed when our entrusted secret becomes an engaging dinner party topic. Self-justification incites a response. But should we respond to the perpetrators of such foolishness? Proverbs 26 says no—and yes: “Answer not a fool according to his folly, lest you be like him yourself. Answer a fool according to his folly, lest he be wise in his own eyes” (26:4–5). 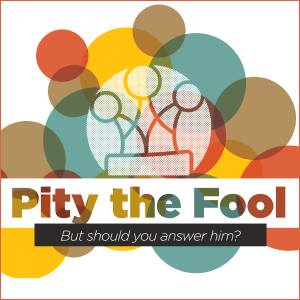 While we ponder over whether we should even answer the fool, it’s helpful to understand who the writer of the book of Proverbs is actually talking about. What words or actions characterize a fool? Using the ESV English-Hebrew Reverse Interlinear, we find that the Hebrew word behind “fool” is kesil (כסיל). Using a tool such as the New International Dictionary of Old Testament Theology and Exegesis, we can see that kesil is related to the Arabic kasila, meaning “sluggish,” and the Akkadian saklu, meaning “stupid.” We find this understanding in Proverbs 14:7, which tells us that knowledge won’t come from the lips of a fool. However, knowledge in Proverbs is rarely purely intellectual. Instead, it’s usually spiritual or moral in nature (i.e. knowing how to live rightly). We can get a better sense of the meaning of kesil by surveying its use in Proverbs. Running a search using Bible software, we find that a kesil has one or several characteristics. Instead of being someone who is ignorant, the fool is evil. He spreads slander (10:18), takes delight in wrongdoing (10:23), and is offended at the idea of repenting and turning from evil (13:19). The kesil is also described as incorrigible and will not heed a rebuke (17:10). He is the opposite of a person of integrity (19:1). Like a bear, he is dangerous—possibly because you never know when he will turn and lash out at you (17:12). Like a drunkard, the kesil is unreliable (26:6). His behavior is reckless and careless, suggesting both arrogance and instability (14:16). Proverbs gives a great deal of attention to the kesil’s speech, urging the reader to avoid listening to him (14:7; 15:2, 7). He loves to blurt out wrongheaded opinions (10:23; 18:2; 29:11). His advice is bad, and those who associate with the kesil suffer for it (13:20). His words, for which he gets beaten up, are ultimately his ruin (18:6–7). In addition, the kesil is an absolute disgrace to his parents (10:1; 17:21). Although his behavior is not necessarily their fault, he seems to be living proof that they have failed in their duties as father and mother. The fool in Proverbs isn’t gullible or simply a bad decision-maker. He may be arrogant, loud-mouthed, reckless or even dangerous. Most significantly, he will not listen to good advice (23:9). Using hyperbole, Proverbs even goes so far as to say that the only way to get through to such a person is with a beating (26:3). We can see what it is to “answer a fool according to his folly”: a severe tongue-lashing. So should we answer the fool, or should we not? Proverbs 26:4 says that someone who speaks like a kesil becomes a kesil. The habit of speaking loudly and abusively can quickly become the norm. By answering in kind, we might lose civility, humility and respect for others—perhaps an occupational hazard for drill instructors or people who deal with demanding customers. Really, it’s an occupational hazard of being human. In some cases, though, hard words are exactly what the fool needs to hear. If we don’t speak to a fool in the language he or she understands, the writer of Proverbs states that “he will be wise in his own eyes.” Speaking to convict him is necessary in order to lead to correction. So there is a time to answer the fool and there is a time to keep silent, says the writer of Proverbs. Responding in the right way requires listening to the Spirit. While silence can be golden, there are times we need to correct the fool. But if we speak or act out of anger or self-justification, what was golden can lead to setting a forest ablaze with a tongue of fire (Jas 3:5). And then, we have become fools.